We’ve designed a new stand, printed our marketing materials, all that’s left to do is brush off our comfortable shoes we’ll be in good shape, ready to exhibit at Leisure Industry Week in a few weeks time. Leisure Industry Week (LIW) takes place at the NEC in Birmingham from 18th to 20th September. It’s the only UK event for the entire ‘out of home’ leisure industry. 250 exhibitors will showcase their products and services to the nine thousand visitors expected to attend over the three days. We are exhibiting in Hall 18, which is dedicated to the leisure facilities sector, on stand F100. 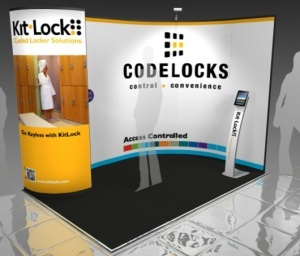 If you are in charge of managing the lockers at your gym, leisure centre or spa, pay a visit to our stand and we’ll show you how to replace the standard cam locks on your lockers with a solution that uses a keypad for access not a key. Locker key management can be a concern due to the high numbers that get lost or accidently taken home. By using KitLock, your clients can simply enter a four-digit code, lock and go; free to enjoy their fitness session without having to carry a key around with them or having to use coins or tokens. We’ve got a special offer for visitors to LIW this year. We are giving away a free KitLock with every site survey booked at the exhibition. During the site survey, we can show you just how easy KitLock is to operate and programme, leaving you a free KitLock sample to keep. We will also give you 20% off your first order. Offer ends Friday 16th November. Visit the stand for more information. For more details on this offer or to book a site survey, visit us on stand F100 at LIW or contact us on 01635 239645.